It's interesting how much of an influence my childhood has had on my favourite flavours. I grew up eating light sponges and regular yellow birthday cakes and I've never had the least bit of interest in dense mud cakes. I had a mug of hot milo before bed on most evenings, and that obsession has never gone away. Grape flavoured bubble tape and Grape Fanta has ensured my attachment to fake grape flavoured treats. And the strip of strawberry in a tub of neapolitan ice cream has locked in my intense love for all things strawberry milk flavoured. It may be artificial tasting to some people and it does tend to make me feel a little ill because I always have too much, but strawberry ice cream, strawberry flavoured milk and (I'm a little ashamed to admit it) Macca's strawberry thickshakes are my weakness. I can never resist it but I always regret it later. Suze was telling me about the strawberry milk macarons from Cafe Cre Asion that sounded amazing and I really wanted to try. With the combination of my strawberry flavoured milk weakness and Suze's encouraging "Dooooo it"'s, I had to test it out for myself. I decided to combine it with another idea that I had for a cookie dough buttercream. It seemed kind of appropriate, I've mentioned on this blog before that I have a serious weakness for choc chip cookies. They are the one thing besides scones that I will whip up randomly just so I can be a total pig, and I can never stop at one. So this macaron flavour was full of all the things I was addicted to. I thought about flavouring the macaron shells with Strawberry Nesquik to give it the strawberry milk flavour, and some quick searching on the internet proved to me that it should work well (see What The Fruitcake?!). I also found a cookie dough buttercream from Annie Eats which looked amazing and I had to try. Oh my god. 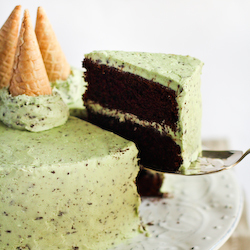 THIS BUTTERCREAM IS ON ANOTHER LEVEL. It is so good. I insist that you try it immediately, put it on a cupcake or just sit there are eat it straight out of the mixing bowl with a wooden spoon like I did. And it has the added bonus of not having any raw egg in it. 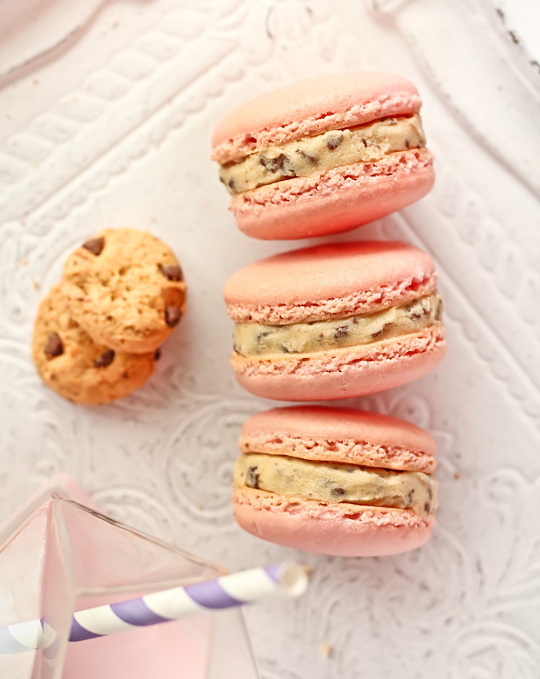 It really tastes just like cookie dough, I also used slightly salted butter to give it a little extra kick and mixed in small dark chocolate chip bits in the hope that it would help offset the super sweetness from the strawberry nesquik in the macaron shells. I was actually surprised by how intense the flavour of strawberry came through in the macarons. It was almost too strong, it kind of overpowered the flavour of the cookie dough buttercream. I'm glad that I made sure to fill the macarons with a very thick layer of buttercream, it really needed it and it tasted so good. I've also adjusted the amount of strawberry nesquik in the macarons because I think I used a little too much in my original recipe. I'd even consider adding even more salt to the buttercream, because it still seemed a tad too sweet for my liking. 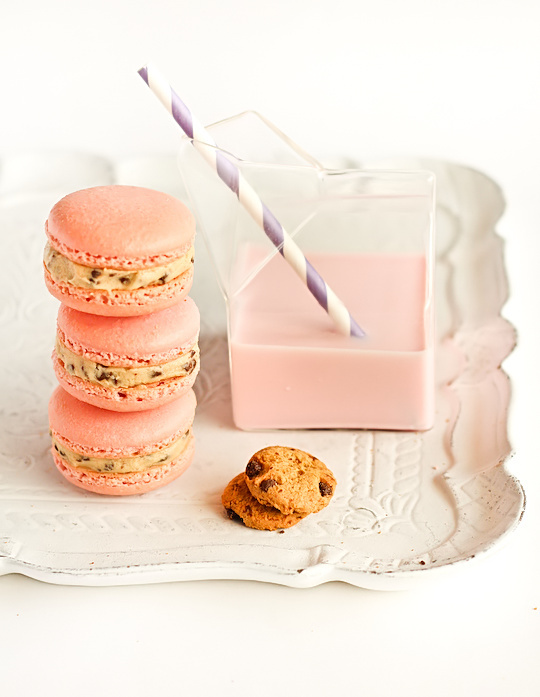 But you really can taste that strawberry milk flavour in these macarons. It might not be everyone's favourite flavour, but it's one of mine and I can't say no to it. Prepare the macarons; Line two baking sheets with baking paper. Place icing sugar and strawberry nesquik in food processor and pulse for a minute to remove any lumps. Stir in almond meal and pulse for about 30 seconds to combine. Place in a large mixing bowl and set aside. Using an electric mixer, beat egg whites and egg white powder in a medium mixing bowl until the egg white powder dissolves and it reaches soft peaks. With the mixer on high speed, gradually add sugar (and then add food colouring) and beat until it reaches stiff peaks. Add meringue and to your dry mixture and mix, quickly at first to break down the bubbles in the egg white (you really want to beat all the large bubbles out of the mixture, be rough! ), then mix carefully as the dry mixture becomes incorporated and it starts to become shiny again. Take care not to overmix, the mixture should flow like lava and a streak of mixture spread over the surface of the rest of the mixture should disappear after about 30 seconds. Place in a piping bag and pipe rounds of about 3.5cm diameter on baking sheets. Tap baking sheets carefully and firmly on the benchtop a couple times to remove any large bubbles. Prepare the icing, beat together the butter and brown sugar a large mixing bowl with an electric mixer on high until creamy. With the mixer on low, gradually add sifted icing sugar, then increase speed and beat until combined. Beat in the flour and salt on low until just combined. With the mixer still on low, beat in the milk and vanilla extract until smooth and well blended. Fold in mini chocolate chips until evenly distributed. Sandwich macaron shells with a generous amount of buttercream, I used about a tablespoon or so for each. Refrigerate overnight in an airtight container to allow the flavour to mature. Serve at room temperature. Wow! 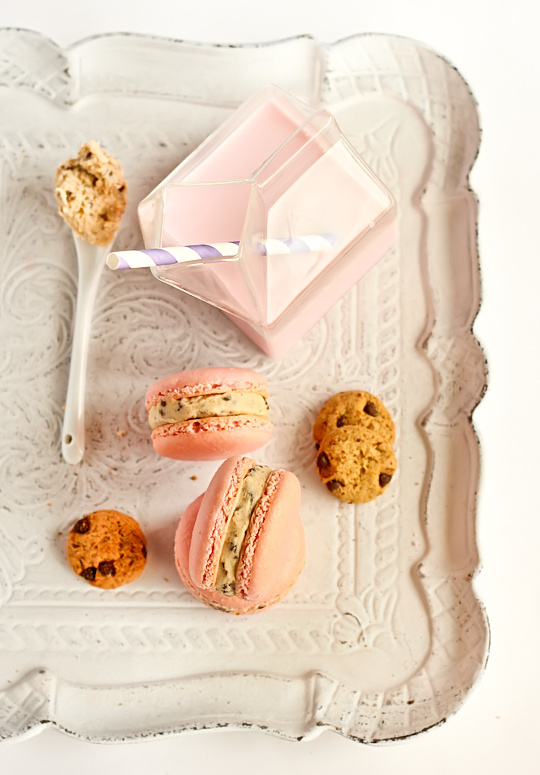 Cookie dough in a macaron sounds awesome! 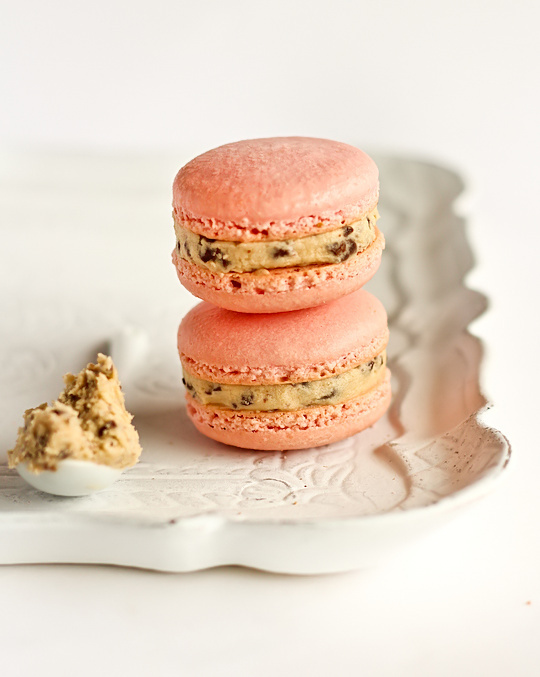 Will have to borrow your cookie dough buttercream recipe for my macarons. Better than La Durée's ones! I'd love to try one of those!! These sound amazing! I love the colour the nesquik gave the macarons, they look do pretty. I need cookie dough buttercream! These look so pretty and I'm so intrigued by the chocolate chip cookie dough buttercream! yum!! I absolutely love strawberry flavored things too.. and paired with cookie dough buttercream sounds so awesome!! Holy shizz, these look great! 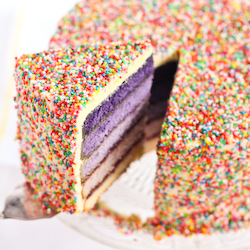 Especially that buttercream, I am definitely trying that out one day soon. Have I mentioned that you're a genius? And nowadays? All I can think is that while teh shells look pretty, I desperately want to make the buttercream so I can eat it with a spoon for lunch. Magnificent! ooh so pretty and pink! 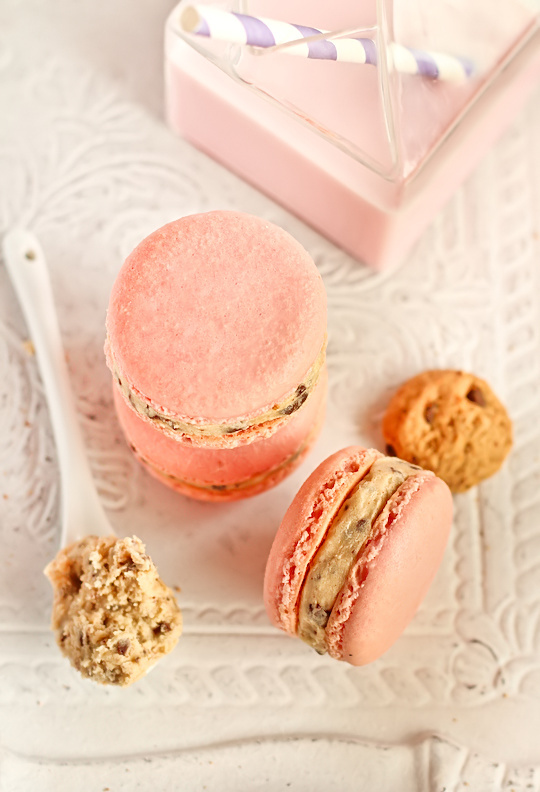 I love the colour of the macarons and cookie dough buttercream sounds awesome! OMG making my mouth water! i have to say.. cookie dough buttercream won me over.. I am so a strawberry Quik girl! And when I was pregnant I craved Strawberry Big Ms - go figure! These look and sound great although I need a bit of convincing about the cookie dough buttercream. I had a macaron baking disaster last week but your recipe restores my faith in what a good macaron recipe should be. 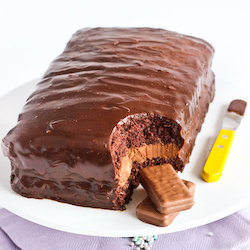 Adding it to my must bake list! oh wow, I have such strong memories of strawberry nesquik shared by my brother and I, although, I must admit he definitely like it more than me. 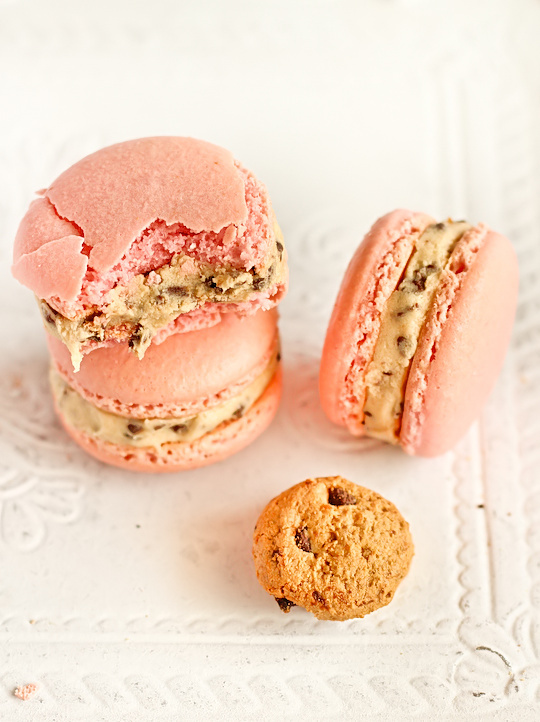 These look delicious and the cookie dogh buttercream sounds sensational, will have to try my hand at macarons! I absolutely love the idea of cookie dough buttercream! I'm not that keen on the taste of artificial strawberry, but as you say it could be something to do with what you know and like. My childhood definitely influenced my tastes in food, although in a slightly different way - my mum never let us have sweets so now I have the sweetest tooth ever! question - where did you get those glass milk cartons?? they are too cute! wow what a brilliant idea! they look gorgeous too. omg these looks amazing!! Wow! Lol you had me at the header lol!! This is just amazing and sounds so delicious thats its all I can think about. YUM!!! These photos are superb. Love that cup! These look amazing and again, your photographs and styling blow me away. Eye candy! Cookie dough butter cream!?! I have never heard of such a thing but it looks amazing! Now that is my kind of macaron. Love the flavour combo and your presentation too. When I first thought to try flavour macarons with strawberry Nesquik I wasn't ready for how good they taste and how much they're strawberry Nesquik! I thought combining it with the other ingredients would kinda tame it or something, but I was thrilled with the way they turned out. I'm glad to meet another strawberry milk fan! I love Macarons. The best I´ve ever eaten are those from the french patissier Pierre Hermé. But yours look gorgeous! Until now I tried only once to make Macarons but I will try once more.. your fabulous recipe is too tempting! I absolutely love your blog and all your macaron recipes! there are so many! I've been desperate to make macarons for my little sister who has a peanut + practically every other nut allergy, any idea what could be used as a substitute for almond meal? I understand this is what gives the macarons their distinct taste but any ideas? Anonymous - I totally understand, I'm actually allergic to all nuts too but only mildly so I can just handle the almond meal (even though I'm not supposed to!). Check out BraveTart's recipe, she uses ground pumpkin seeds http://bravetart.com/recipes/NutFreeMacaronsGF, and I've also seen some recipes that use sunflower seeds. Good luck! cookie dough buttercream?! thinking about making it and just eating it by the spoon full :) so much for that new years resolution! OMG how do you do this, I have tried recipe after recipe, I bake nearly every day & I can not master macaroons, is there a secret, I'm desperate to master the little suckers ! I'm making this cookie dough buttercream right now for some chocolate cupcakes. Oh my god! So so so good! Where did you get your milk container/glass? It's darling! Do you know how many this yields? OMG! I just made these, following your recipe, and wish I could post a photo! They turned out perfectly. Rather than spend $6 on a tin of Nesquik I would never use again, I decided to try about 1/3 of a package of strawberry Jello-O. Score! Thanks for posting this recipe and flavour combo. I can't wait for my friends to try these. 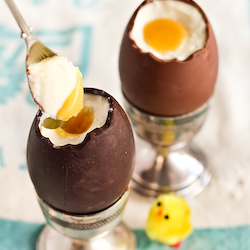 I'm making these with banana milk ^^ They are absolutely delicious! You can if you have fine enough almond meal - then you just need to sift the icing sugar and almond meal together. If not you may end up with very bumpy shells. Just wondering but were your strawberry milk shells hollow? Each time I make these macarons they turn out hollow and I was just wondering if there is something in the nesquik that prevents the insides with rising... Or if it is just me and my technique... Lol looking forward to your reply! How much meringue do you add? I don't see it in the ingredients list! Ashley, the meringue is the egg white and sugar mixture from the previous step. My Macarons are flattening when I let them cool :( Any clue at what I am doing wrong? Sounds like you're taking them out of the oven too early! 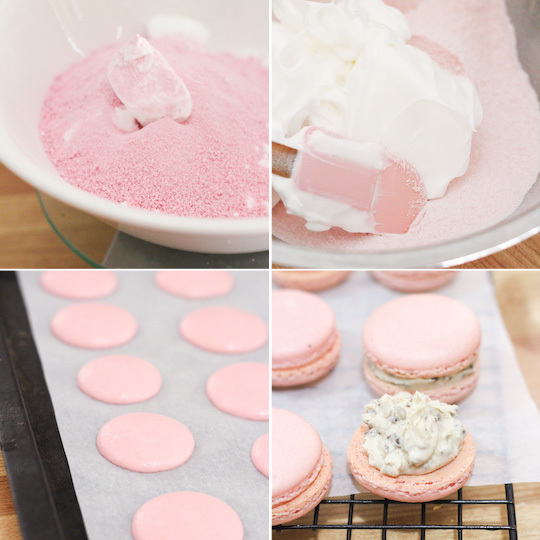 This macaron recipe is delicious. When I made mine I omitted the cookie dough filling and replaced it with a coconut and white chocolate ganache. Just beautiful. Thank you for sharing your recipe.